Speculating about why his recent blog post on real estate commissions "under siege" generated over 200 comments, Bradley Inman, founder of highly respected Inman News, asked readers if the existing commission structure had reached a "tipping point?" 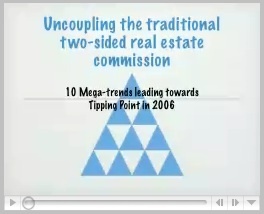 Yes, ten mega-trends, some of which Inman identified, have pushed the obsolete commission structure to a tipping point; but from the real estate consumer's perspective, the commission won't reach a break point until the traditional two-side MLS commission is "decoupled" -- a recommendation the Consumer Federation of America first made fifteen years ago. Unbundled Pricing brings innovation to the cost of selling or buying a home. Selling a home requires a certain investment, as does finding and buying one: equal tasks with equal expense. Curiously, traditional commission models require the seller to pay for both of them. We believe it would be more logical if each paid for their own part of the transaction, so we treat them separately (emphasis added). We also use a scaled percentage model that reduces the rate for higher priced homes. It is equitable, straightforward, honest, and revolutionary (emphasis added). Anyone else agree it's long overdue, and due time federal regulators make it -- uncoupled commissions -- happen? NOTE: Your email address will not be published on this page with your comment. Followup to your comment will generally appear here. Occassionally the Real Estate Cafe may use your email address to followup with you directly however it is not shared or given to anyone else nor added to a RE Cafe mailing list. Personally as a first time buyer (at some point), I would be interested in a buyer's agent commission structure that rewarded the agent more for lower prices. Currently, buyer's agents who accept the standard commission structure make more money when you pay more for your house, if I understand things correctly. That seems a bit backward. I would much prefer a structure that rewarded the buyer's agent for negotiating the price down, especially since his domain knowledge would probably enable him to negotiate better than me. Do commission structures like that exist? All real estate commissions are theoretically negotiable. Your criticism is a fair one, made a number of times over the past 15 years since buyer agency came into the Boston marketplace, by reporters, consumer advocates, and most recently an economist at MIT. The Mass. Association of Buyer Agents position is that the margin increase in earning for the buyer agent in any single transition is too small to risk their long term professional reputation as consumer advocates. The Real Estate Cafe's would be delighted to work on the performance based compensation you suggested, and have actually recorded a blog post on the subject, but never released it. Would you like to hear it? Thanks for your continued posts on our blog, and hope you'll participate again in the next Bubble Hour. While it is plausible that the loss of reputation may be enough of a deterrent to prevent collusion, I was less interested in preventing collusion and more interested in how things could be structured to provide an incentive to negotiate the price down. Under the traditional structure, the only benefit to negotiating the price down would be in reputation and even that would be offset to some extent by the reduced commission (albeit possibly marginally). If there were a significant financial incentive in place to negotiate the price down, then negotiating may become more of a priority for buyer agents in general. Who knows - maybe it would even become their primary value proposition (at least for some clients). Yes, I would be interested in hearing your blog post on this subject. There are real estate offices where agents pay a monthly fee for brokerage services and office space, and keep all of the commission earned from their closings. But unless those agents are the listing and selling agent for a transaction, they do not typically receive the entire commission paid by a selling client. The rent-your-space option works best for agents with an established clientele and regular closings, because fixed monthly fees can be hefty, and each agent is responsible for every expense associated with doing business. Thanks for your post. Looks like you have an interesting web site. I look forward to exploring it further. 1. As you suggest, there are some well known 100% commission concepts, but I've never drilled down into their cost structure so I do not know what kind of fixed monthly costs agents in those settings are incurring. 2. In contrast to those models, which force agents to bill clients hourly or collect commissions just to break even, new salaried concepts are compensating agents, presumably every pay period rather than waiting till closings. My understanding, although limited, is that these types of business models are commonplace in London. 3. Since my original post was about trends leading towards the unbundling of the two-sided commission, it's important to separate the question of how one gets paid from what one gets paid. Your statement, "...unless those agents are the listing and selling agent for a transaction, they do not typically receive the entire commission paid by a selling client," is correct. My question is why is the listing side still setting the selling side's compensation, regardless of who collects it? 4. I'm not sure when the rent-your-space concept works best, but if do-it-yourself buyers and sellers need less than full service, my question as a consumer advocate would be, will the rent-your-space overhead be replaced by something more efficient in the future? I'm eager to watch new buyer agency models which combine call centers with self-service tools and field staff. The idea of one commission that is then split comes from the old sub-agency days when the "Buyer's Agent" was in reality a sub-agent of the listing agent and therefore really worked for the Seller. Depending upon one's perspective, it is really the Buyer who is paying for everything, even though it may be the Seller who "negotiated" how much the Buyer was going to pay their agent as well as the Seller's agent. If we changed "the system" so that the Buyer independently negotiated and directly paid their agent it would then "force" the Buyers to sign Buyer Rep agreements and I would expect that they would then be charged a retainer up front. I do not know that there is a perfect answer to this question, but I do know that ultimately the Buyer pays...you can call it what you want, and put it under whichever column, but it is part of the priced paid to the Seller. It reminds me of how people ask their state to apply for federal disaster aid or other forms of federal funds like it is not still coming out of their pockets...you pay both state and federal taxes, so the pot is really you and not "them". A very complex issue to say the least--hard to decide where to start. I am speaking as an agent with 4 years recent experience, with a prior stint in real estate in the late 80's before the crash, with many years in the construction and engineering fields as well. I think one may argue back and forth inconclusively about this. As to the issue of decoupling, ever since I started in Real Estate, the question has always been in the back of my mind as to why the seller usually pays all the commission. When the distinction between buyer's and seller's agent became standard, that question became more prominent. While you may argue that the money secretly is coming out of the buyer's pocket, the fact is that at the clsoing table, the seller is always paying up to five times the closing costs as the buyer, and it's that kind of immediate bottom line that matters most to people and affects them most directly. However, decoupling is already occurring, being pushed by flat fee, discount, rebate, and pay-for-service brokerages. When the flat-fee company, for example, lists a property, they collect their fee and it's up to the homeowner to negotiate their commission with the buyer's agent. Inevitably the decoupling will occur more broadly, but should it be made into law? Maybe the best road ahead is to be able to offer the consumer this and other alternatives and let the market decide. What peple want and need today, and the market desperately needs, is more alternatives that help the consumer save some money while agents are pushed to provide more service value. Clearly this is the way it is heading, and unlike most agents I know, I am looking forward to the changes. The idea of posting a blog about this is really great. You have fair good points in here. I agree with what you are saying.